Reprinted from the Lafayette Journal and Courier, Nov. 3. Dr. Bray is second from left in the front row. Chemistry lost its virtue as a pure science when its technological importance to the military was recognized in World War I. Physics followed the same path in World War II when it played a dominant role in two major wartime projects, the development of radar at the M.I.T. Radiation Laboratory, and the creation of the atomic bomb at Los Alamos, the "Manhattan Project." At the beginning of WW II, radar was sufficiently developed to be of crucial importance in the air battles over England. The objective of the Radiation Laboratory was to improve its capability. In contrast, the concept of an atomic bomb was in its infancy and its viability was merely a conjecture, but a sufficiently convincing one to engage unprecedented scientific and material resources. The accomplishments of both of these projects, in quite different ways, revolutionized not only physics but also society. The revolution continues and its consequences are evident daily. Purdue physicists participated in both of these monumental efforts. For a short time, the Purdue cyclotron was used for work connected with the Manhattan Project. A larger group was set up by Karl Lark-Horovitz (KLH), then department head, to supplement the mission of the Radiation Laboratory by exploring the feasibility of using germanium to develop better crystal rectifiers, a crucial component for radar. I was involved, in very different ways, in both projects. The cyclotron group included Purdue professors William Schreiber and Lionel King, and several visitors from other universities. My own participation was most unwitting. Shortly after I arrived as a graduate student in September 1942, I was invited to join the group but was told nothing about the atomic bomb project and Los Alamos. My first (and only) task was to build a Hartley oscillator, an effort which got no further than the breadboard stage. The project terminated suddenly when the senior staff members and some of the graduate students disappeared, apparently transferred to Los Alamos. Tragically, one of those students, Harry Daghlian, was one of the two scientists who died there in a radiation accident resulting from a runaway nuclear reaction. Only after the war was over, when I received an award for my efforts (a copper pin! ), was I made aware of my participation in that project. The other wartime effort, the crystal rectifier project, was the beginning of Purdue's pioneering involvement with semiconductor research. It began in March 1942 with a research grant from the Office of Scientific Research and Development, a unit of the National Defense Research Council. Purdue undertook development of an improved point contact crystal rectifier, a device made by pressing a sharpened metal wire (a "cat whisker") against a piece of semiconducting material. Crystal rectifiers made with sulfides and oxides were used in the early days of radio, and KLH had experience with them in WW I. They became obsolete with the invention of the diode vacuum tube which was much more reproducible and reliable. However, with the advent of microwave radar, interest in crystal rectifiers revived because their low capacitance made them particularly suitable for operation at microwave frequencies. Because of their added merits (small size and low power consumption) they eventually replaced vacuum tube diodes. In 1942, silicon already had been successfully employed in the so­called "red­dot" rectifier detectors developed in England. It was also known that germanium was capable of rectifier action. However, there were many inherent problems with crystal rectifiers, foremost of which were their inconsistent performance due primarily to the poor semiconducting material quality, and their susceptibility to electrical "burn out" when power was applied. Consequently, Purdue's mission was to develop a compact, sensitive and shock­proof crystal rectifier for microwave radar receivers. KLH recognized that even in those urgent times it was necessary to back up the applied work with basic research into the material properties. He established several groups with different objectives: to grow better material, to evaluate the material electrically with Hall effect, resistivity and thermoelectric measurements, and structurally with x­ray and electron diffraction measurements, and most importantly, to design, produce and test the crystal rectifiers. The importance of careful control of the material was recognized from the beginning. The alloying of the elemental material (the addition of appropriate impurities which is known as "doping") determines its electrical properties. It was necessary to make the material as pure as possible, and then to experiment with the doping to achieve the desired properties. The effort at Purdue in 1942 shifted early from silicon and galena (PbS) to germanium. This decision was based on the assumption that it would be easier to purify and control the impurity content of germanium because it had a lower melting point, and thus would not react as readily with the crucibles and furnace materials. The choice of an elemental semiconductor was particularly fortunate. Even after many more decades of research, it has been difficult to obtain semiconductor compounds as good as the elemental materials, germanium and silicon. Success in growing germanium crystals was crucial; everything else depended on this since there was no available source of this material. Unlikely as it seems, this task was assigned to one graduate student, Randy Whaley. He also had to establish and maintain contact with the Eagle­Picher Company; germanium had been an unimportant by­product of their tin production. His task was to develop techniques for purifying raw germanium dioxide powder (GeO2) which was subsequently reduced in a hydrogen atmosphere. The germanium was subjected to prolonged heating in vacuum to further purify it. Whaley started with the highest resistivity bulk material that he could grow, then remelted it and deliberately alloyed it with different impurities. The group which evaluated the electrical properties of the germanium crystals consisted of two professors, "Wally" Walerstein and, briefly, E. P. Miller, and graduate students Art Middleton and Wayne Scanlon. They determined the type (p or n) of the material, the concentration of carriers and their mobilities. The theoretical analysis of these measurements was undertaken by KLH and Professors Vivian Johnson, and (for a short time) Bob Sachs. Visiting consultants contributed to the effort, including Lothar Nordheim, Karl Herzfeld, and Victor Weisskopf and Esther Conwell who developed the theory of ionized impurity scattering. The x­ray and electron diffraction investigations of the semiconductor surfaces were performed by Professor Hugh Yearian and a student, Ted Renzema. The largest group, responsible for the fabrication, testing and evaluation of point­contact rectifiers, the raison d'être of the project, consisted of Professors Yearian and Ron Smith and a flock of graduate assistants including Seymour Benzer, Lou Boyarski, Paul Pickar and A. McDonald. I was ultimately assigned to this group when I was released from my "duties" on the atomic bomb project. From this group, only Benzer and I "survived" to obtain doctoral degrees. Our tasks included assembling and testing rectifiers, improving their performance, and testing the poorly­understood theories of rectification. We studied the effect of different surface treatments such as chemical etching techniques, and of different methods of making contacts such as by welding to resist burnout effects. The earliest and best recognized triumph of the Purdue group was Benzer's discovery that led to the group's development of germanium crystal rectifiers capable of withstanding very high reverse voltages greater than 100 volts. This invention solved the "burnout" problem and made feasible widespread use of these diodes. The group focused its efforts to produce the diodes in quantity for testing at the Radiation Laboratory and for mass production at Bell Laboratories. The importance of this device may be judged by the speed with which several industrial laboratories went into commercial production after the war. It was patented by Purdue and modest royalties were actually paid and split between the University and the inventors. Benzer's doctoral thesis was based on the properties of the high back­voltage rectifier, its dependence on voltage, temperature and incident light (photoelectric effect). From the point of view of basic research, a major accomplishment was the analysis of the Hall, resistivity, thermoelectric power and mobility measurements for germanium. The intrinsic energy gap was determined, the thermal activation energy of shallow impurities was measured, and the relative contributions to the mobility of electrons and holes from different scattering mechanisms (lattice acoustic phonons and ionized impurities) was analyzed. (Middleton and Scanlon obtained their doctorates from this work.) From this work it was established that germanium was indeed a semiconductor, obvious today but at that time a matter of debate and controversy. Unfortunately, because of KLH's reluctance to publish, most of the work appeared in abstracts for conferences and brief reports, and the appropriate credit failed to accrue to the Purdue group. In assessing the work at Purdue, it is necessary to appreciate the primitive nature of both the technology and understanding of semiconductors in 1942. While the basic model for semiconductors had been formulated by A. H. Wilson in 1931, detailed knowledge of the growth processes and properties of these materials was quite meager. In Seitz's encyclopedic text, Modern Theory of Solids (1940), silicon and germanium were not mentioned. And although the all­important role of impurities was recognized, and the hydrogenic model for impurity levels had been formulated, the primitive level of understanding that was prevalent, at least in the earliest stages of the work at Purdue, is best illustrated by the trial and error approach in which crystals were alloyed with dopants from nearly the entire periodic table. However, by the end of the war, when the final report was written, it was recognized that dopants from column III of the periodic table produced p­type material, and those from column V produced n­type material. The n­type material gave good rectifiers, whereas the p­type material did not, an observation that was not understood for a long time. In spite of the early difficulties, the first "good" semiconducting germanium crystals (at least sufficient for the purpose at hand) were made at Purdue. (This constituted Whaley's doctoral thesis.) In fact, a germanium crystal made at Purdue eventually was used for the first transistor built at Bell Laboratories. The Purdue work established germanium as a useful and valuable semiconductor. That element became the model for our understanding of semiconductor properties, a testimony to the wisdom of its choice by KLH (presumably) in the early 40's. To what factors can we attribute the accomplishments of the Purdue semiconductor project? It began with no expertise and little background in semiconductors or radar. 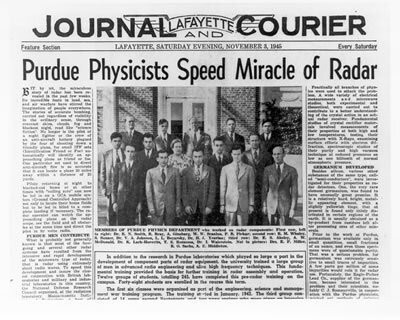 The mix of researchers was accidental; they just happened to be present at Purdue at that time. One factor in the success of the project was its very specific focus, its well-defined goal which kept the work from straying. The exigencies of the time exerted strong psychological pressure which led to a dedication to hard work. The lights were on in the laboratory every night of the week. This routine was habit forming, and lasted long after the war. The other factor was the leadership, forcefulness and guiding spirit of KLH. He organized and directed the project and assigned the problems to be studied. Although he did not actually contribute much to the analysis of specific problems, he did provide direction. He began frequent group seminars with summaries of his extensive reading of the literature, and of what was happening in the world outside of Purdue. He continuously pressed us to come up with new results and to discover new phenomena. He kept tabs on our hours worked. No one dared to leave Lafayette on weekends. He could be charming and fascinating; he could also be overwhelming, and his temper was intimidating. However, by virtue of his drive and ability to convey great excitement for research, KLH provided us with a very stimulating and exciting atmosphere in which to work. Even during the war, he was able to add to the department such luminaries as Schwinger, Sachs, Lanczos and Meissner, although for some, the stay at Purdue was all too brief. KLH exploited his wide acquaintance with refugee European scientists to attract to Purdue a steady stream of visitors, such as Heisenberg, Bethe, Pauli, Teller, Weisskopf, Frohlich, Herzfeld and Nordheim. He built his department, fought for it with the Purdue administration, and kept it going during the war, in spite of the exodus of many staff members to the Radiation Laboratory and Los Alamos. Finally, I have made little mention of the relation of Purdue's work to the invention of the transistor at Bell Laboratories shortly after the war. Long before the work at Bell, Smith, Benzer and I obtained anomalous results which were eventually seen to be relevant to the concept of the transistor. This is a fascinating story which we must leave for another time. "Dr. Bray, a graduate of Brooklyn College, received both his M.S. (1945) and his Ph.D. (1949) from Purdue. After graduation, he remained at Purdue where, except for sabbatical leaves and other short absences, he has spent his entire professional life. Dr. Bray's experimental studies in semiconductor physics have led to a distinguished career." Although retired, Dr. Bray continues to remain active in physics. At the present time, he is lecturing in Japan. The final editing of this manuscript was done in his absence. We hope that we have not tampered unduly with the spirit or substance of his work.